Page revised in November 2015. Photos taken with Canon Powershot SX 700 HS. You may wish to see an introductory page first. 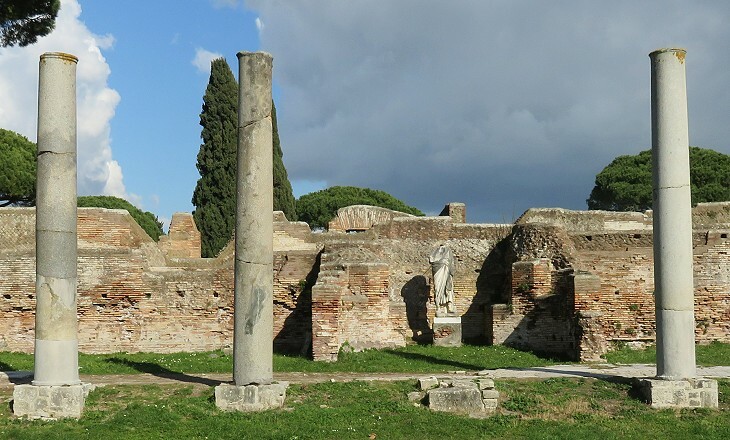 The centre of Ostia was the Forum where the main buildings of the town were located. It was situated at the junction between Decumanus Maximus and Cardo Maximus, the two main streets. Emperor Tiberius built a temple dedicated to Rome and Augustus in its southern part, but most of the other buildings and the overall design of the Forum are dated first half of the IInd century AD during the reigns of Emperors Trajan, Hadrian and Antoninus Pius. 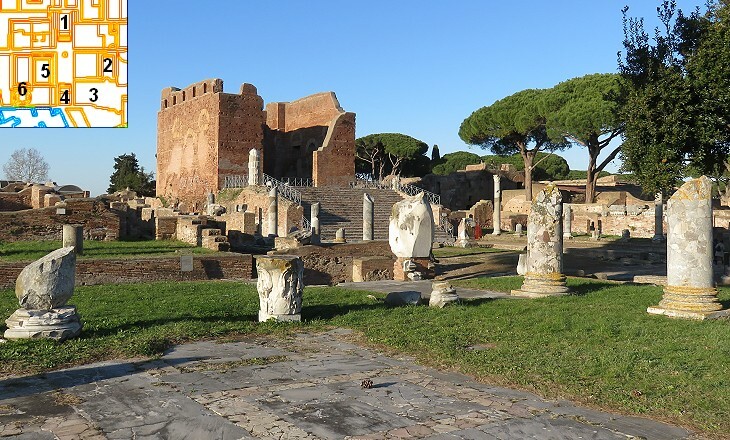 The Capitolium at Ostia is probably to be identified with the temple whose high podium renders it conspicuous among the ruins of the city. This temple has long been popularly known as "tempio di Giove" or "tempio di Vulcano". It has recently been pointed out that the long base at the rear of the temple was apparently intended for three cult statues, and that the high podium, found also in the Capitolia of Pompeii, Timgad, and Lambaesis (or Thugga and Thuburbo Majus), seems to have been employed in places where the Capitolium could not be placed on a hill as at Rome. For centuries the high podium of the temple was the only visible remain of the ancient town, because its other monuments had been entirely covered by the ground level rise caused by floods. The Capitolium was dedicated to Jupiter, Juno and Minerva, but it actually symbolized the City of Rome and more in general the Roman nation/community. Its construction indicated that a town was proud to be part of that community. Ceremonies celebrating events of the history of Rome or of the life of the emperors were held at the Capitolium. Heads of broken statues of emperors were among the findings of the first excavations carried out at Ostia. 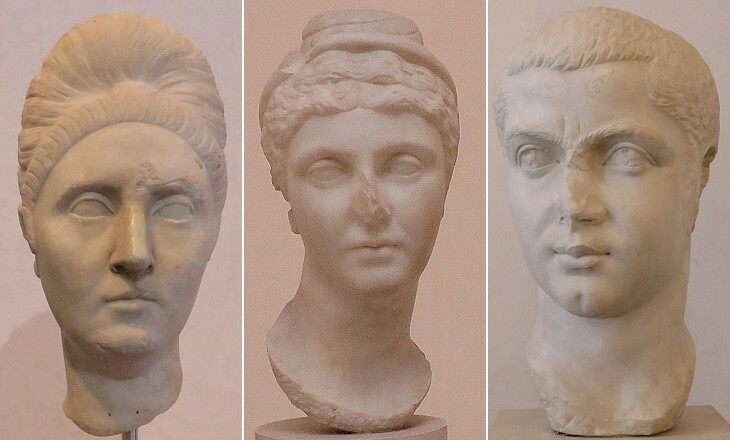 Systematic excavations carried out from the second half of the XIXth century led to finding other broken statues of emperors and of their wives. Archaeologists assume many of them were placed in the Forum, however they were found in other locations, often near lime kilns (e.g. those of Marcus Aurelius and his wife portrayed as Mars and Venus). 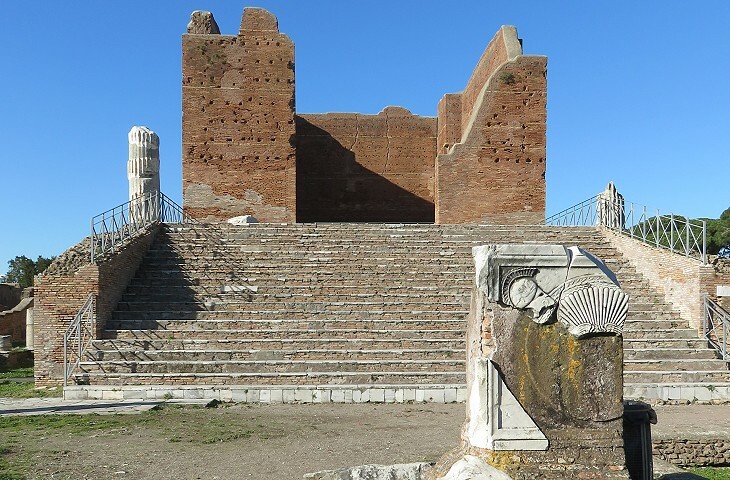 Overall the number of broken heads found at Ostia exceeds that of the statues without a head. Some of the long necks shown in the images above are modern additions. 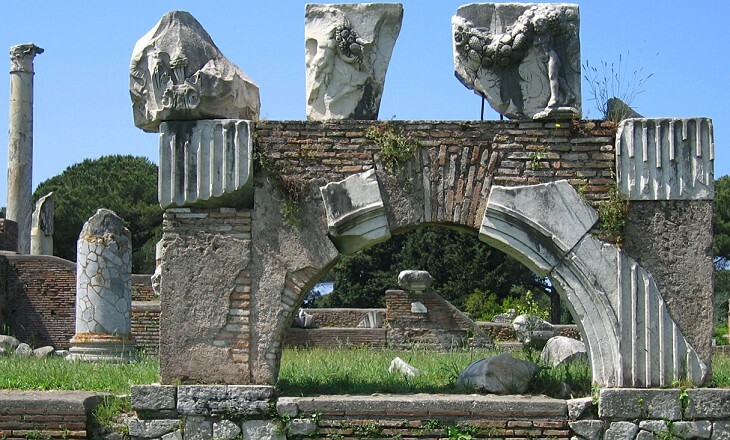 The Forum housed statues dedicated to local magistrates and benefactors in addition to those celebrating the emperors. We know from inscriptions that some of them were equestrian statues. According to President de Brosses, a French traveller who visited Rome in 1739, statues amounted to a quarter of the population of the City. He most likely would have said the same about Ostia, had he visited it in the IInd century AD. The Latin word basilica originated from Greek roots meaning "Royal Hall", a covered place where kings or their appointees administered justice. 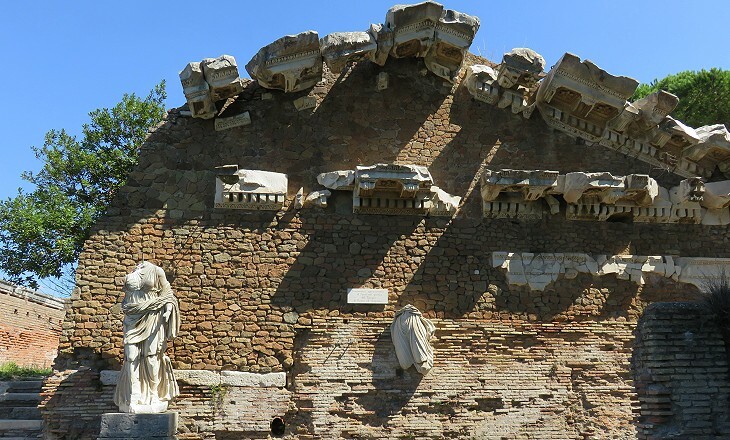 In addition to being the seat of a tribunal, a Roman basilica was a meeting place to discuss politics, do business, announce new laws or initiatives. Basilicas had a rectangular shape with three naves and occasionally one or two apses. The central nave was higher than the others so that windows could be opened in the walls supporting its roof. 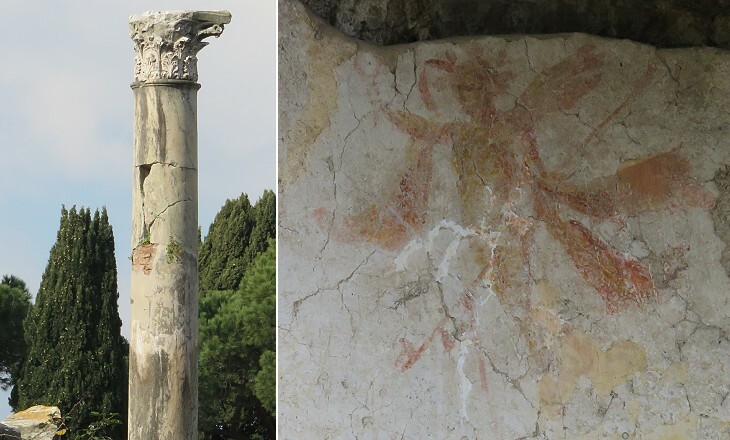 The basilica of Ostia is dated late Ist century AD, but some embellishments were added in the following century. Temples to Rome and Emperor Augustus were in a way another type of Capitolium in the sense that they too expressed the loyalty of the town to Rome and its emperors. Examples of such temples can be found in many cities of the Empire including Athens and Ancyra (Ankara). The construction of such temples was accompanied by the appointment of a flamen Romae et Augusti, a senior citizen in charge of the ceremonies which took place in the temple and more in general of promoting the worship of the deified emperors. A round temple preceded by a large court was the last major addition to the Forum. It might have been built by Emperors Alexander Severus or Gordian III. Its shape and the fact that it had seven niches suggest that it was dedicated to a plurality of gods, similar to the Pantheon of Rome. The fact however that many heads of lost statues found at Ostia portrayed emperors rather than gods could indicate that the round temple was dedicated to them. Assuming this hypothesis to be correct the Forum of Ostia would have had three temples celebrating Rome and its emperors. 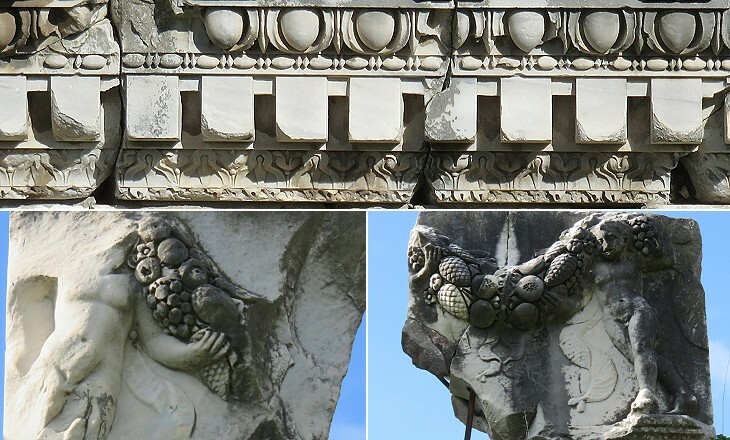 Fragments of marbles and reliefs from monuments of Ostia have been identified inside the Cathedral of Pisa which was built in the XIth century. Most likely the Pisans were not the first nor the last who took away materials from the ancient buildings. It appears that some of the marbles which were used in the reconstruction of S. Paolo fuori le Mura came from Ostia. The Forum provided some ancillary facilities to those who spent their days there. 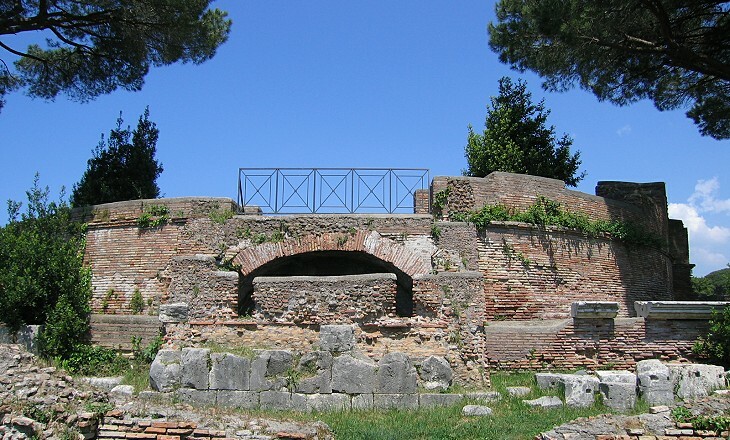 A number of caupona, shops where wine and ready dressed meals were sold, have been identified in streets near the Forum. Other facilities, including baths and latrines, can be seen in a second page covering the Forum and in the section of Cardo Maximus nearest to the Forum. 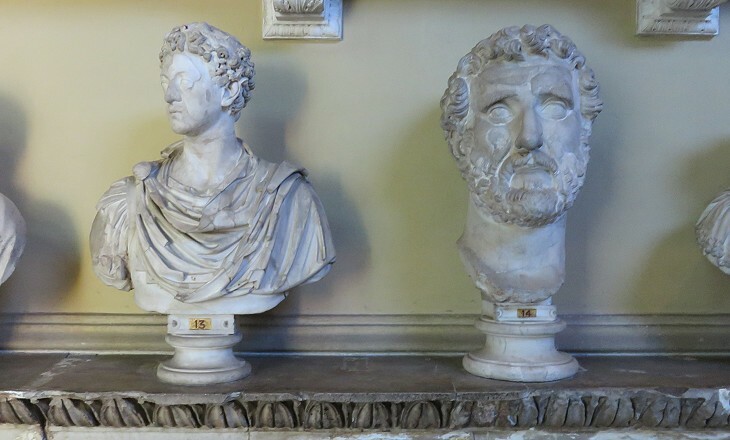 The image used as background for this page shows a head of Emperor Hadrian at Museo di Ostia. Move on to the next step in your tour of the Environs of Rome: Porto.